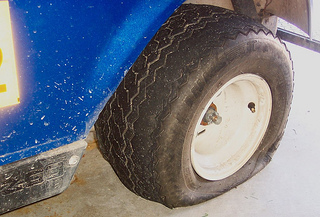 Keep your golf cart tire at the right pressure and replace it when it is worn. 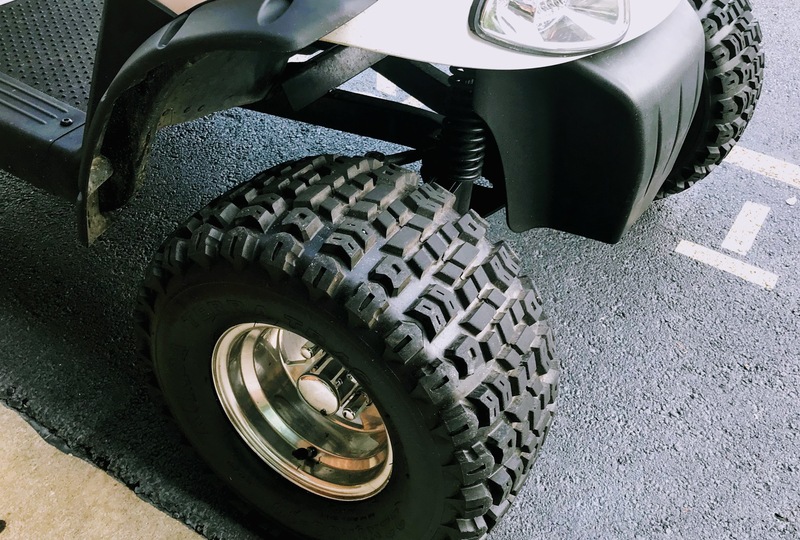 There are many different options for tire sizes and treads, depending on how you use your golf cart. You will find that golf car tires are quite standardized. Larger tires are used on golf carts that are lifted or on carts that are used for utility reasons and carrying heavy loads. Golf cart tires come in a variety of sizes. 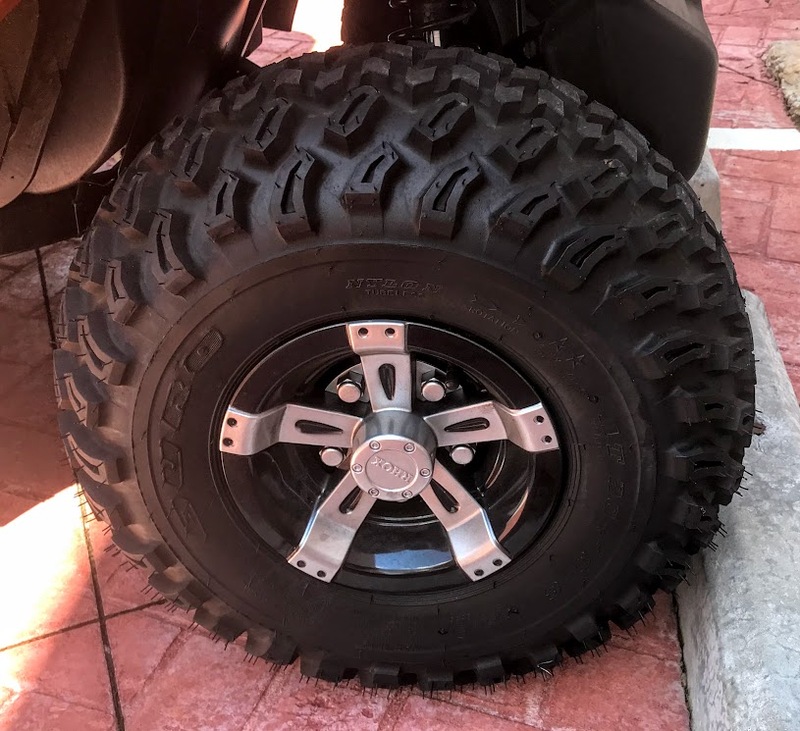 The height of the tire and the wheel size both need to be considered. The standard wheel or opening size is 8" but golf cart wheels also come in 9", 10" and 12" sizes. An 8" wheel usually accommodates an 18" tire. 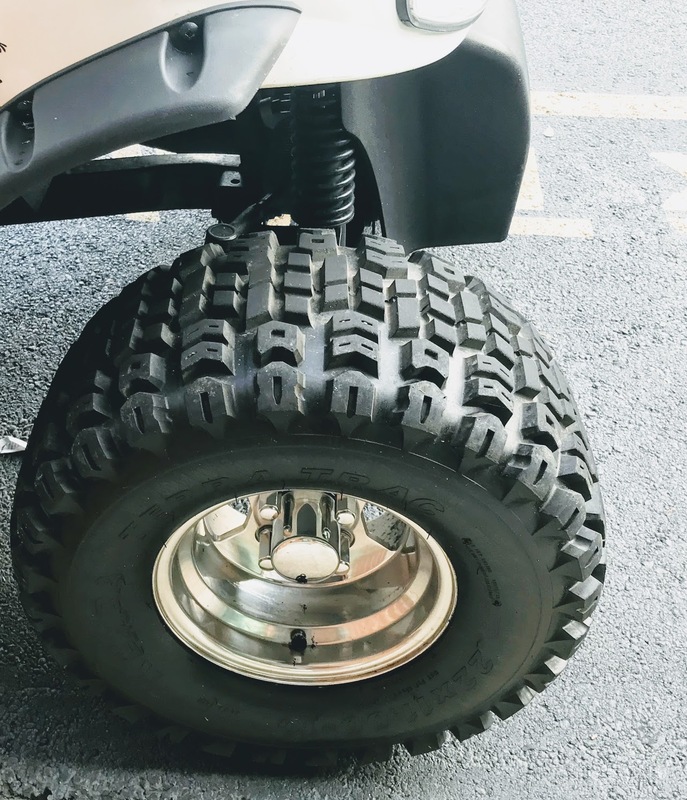 Standard factory golf cart tires are 18x8.5-8" tires. 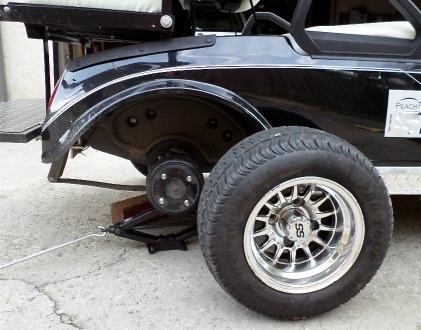 A non-lifted golf cart can use an 18.5" tall tire, and some golf cart models can take a taller tire. If you use your golf cart like I do for golfing, you need to be sure your tires are "golf course approved." Certain off-road treads are not allowed on golf courses so be sure to check with your local golf course before making a new tire purchase. This Club Car golf cart has 10 inch golf cart wheels. It's a "beefier" tire compared to the standard tire. I love the smoother ride and the more custom look it provides. Also because I spent a lot of money on custom golf cart wheels, I wanted a long lasting and durable tire. Did you know that the EZ GO RXT can accommodate a 21" tire with a 14" wheel without having to install a lift kit? You can always find the current size of your tires by checking the sidewalls - all of the tire info is printed right there. 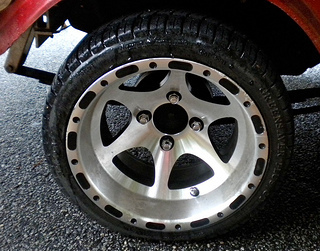 Golf cart tires and rims can be simply functional for a smooth ride or they can give a custom look to any golf cart. These are usually the standard tires that come on a golf cart. They can be used on the golf course and are good for riding on golf cart paths. 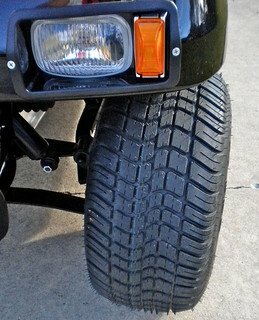 As the name implies they are good for off-road driving in woods, mud, or sand. The tread is very knobby and thick. They do not give a comfortable ride on a smooth street surface. These tires are a combination of the two. Not as smooth as the street tire and not as knobby as the off road tire. The standard is a 4 ply tire. This is good for our cart which is used regularly for playing golf and riding the golf cart paths to get around town. Consider a 6 ply tire if you are using the cart to carry heavy loads - i.e for carts with trays on the back. Duro is a commonly used tire that is often used as the original golf car tire. This is the tire that we have on our cart which has lots of usage and lots of miles on it. Other common brands are Innova and Carlisle. 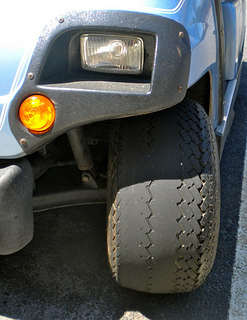 A low profile golf cart tire gives a customized look to your golf cart. Tires can be purchased separately from the wheels and then you would pay a local shop to mount them for you. Depending on the tread, these tires can be used on the golf course. 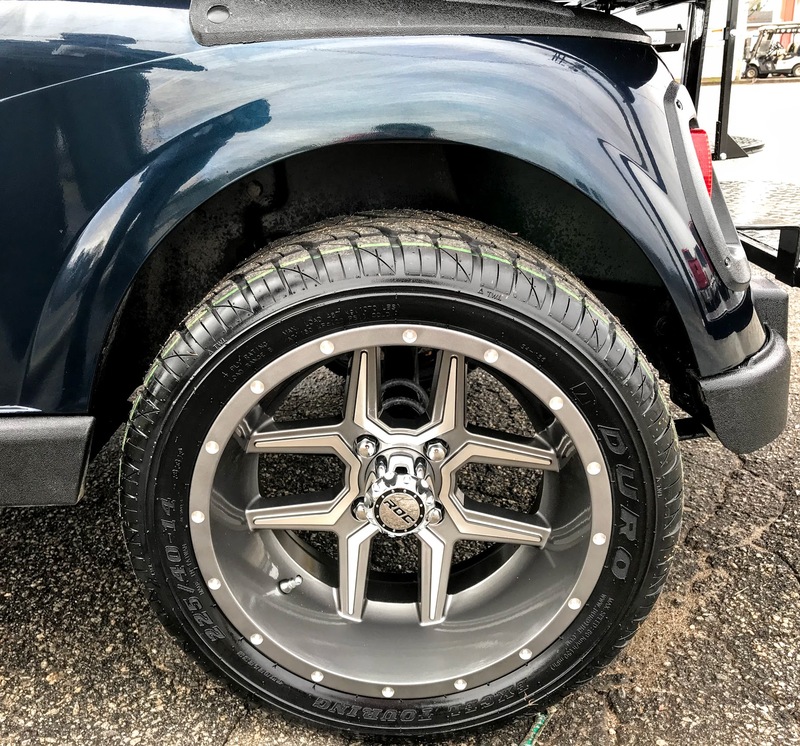 One of the advantages of a low profile tire is that they can be used without having to add a lift kit. Have you considered getting used golf car tires to replace your worn tires? It's possible when you live in a golf cart community where there are lots of golf cart businesses. Golf cart salvage places often have some good used tires. Find out what to look for before you go this route. 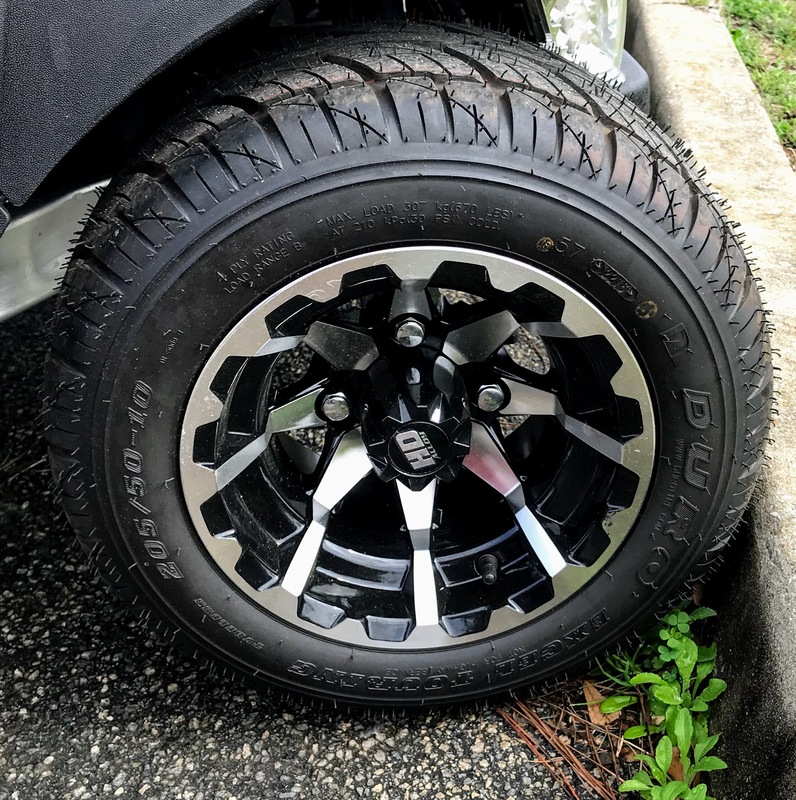 Golf cart tires and rims can be purchased as a package if you want both new wheels and new tires. Standard rims are going to be just plain white or almond colored. If you buy the golf cart tire at the same time you are purchasing a golf cart wheel, the mounting is often free. Golf cart wheels can be made of steel or aluminum. The standard golf cart wheel uses a 4 on 4 golf cart bolt hole pattern. This standard hole pattern typically fits an EZ Go, Club Car or Yamaha golf cart. There are some cooool looking ones out there. Of course they are more expensive - but hey, we are in our golf cart more than our car! The steel rims are the more standard ones and are less expensive. For a more custom golf cart, select one of the many styles and finishes that are made from aluminum. The number of spokes range from 4 to 14. Whens selecting your golf cart wheels you will need to know the size of your tires. The most common wheel sizes are for 8", 10" and 12." Golf cart hub caps or wheel covers are a less expensive way to dress up your golf cart. They can give you a custom look to a golf cart for a lot less than the cost of custom golf cart wheels. Sold in sets of 4, they come in a variety of styles and colors to suit your taste and budget. When is it time to replace your golf car tires? 1. They will no longer hold air. Just like car tires, when the tread wears down it's time to start shopping. 4. Places of swelling are also signs that new tires are needed. If you notice that you need to put air in every couple of weeks, your tire is experiencing a slow leak. It is important that you maintain the proper air pressure in your golf car tires. Tire pressure varies between each manufacturer and style of the tire. Golf cart tire rotation is usually driven by how much you use your cart. Even tire wear is desirable to extend the life of a set of tires. If you have a problem with the suspension on your golf cart and the tires are wearing uneven, rotating your tires will not help. Normal wear can be caused by just the weight difference between the front and back of the cart. Keeping tire wear even can be as simple as rotating them periodically. I normally just use the jack from my car to lift the golf cart. Most cars will have a scissor jack that will fit under the suspension of the golf cart. Place the jack where the golf cart service manual recommends or on the axel of the cart. I find it helpful to break the torque on the nuts with the full weight on the cart before I jack it up. If the nuts are tight on the front tires and you jack the cart without breaking the torque the tires will just spin. Always put the brakes on the cart before you jack and NEVER put any part of your body underneath the cart when it is raised off the ground. I like to rotate my tires front to back because it is easier than crisscrossing them. If the manufacturer has a different recommendation then follow it. I jack the front of the cart first and then place blocks of wood underneath the suspension and lower the front. I go to the back of the cart and remove the back tire. Be careful because the weight of the cart is all on the opposite side and is just balancing on a jack and stack of wood. Do not allow anyone or anything get in the cart when it is on a jack. I like to clean the inside of the tires before I reinstall them. It gives my custom wheels a brighter look. Install the front tires on the rear and then install the rear tires on the front. It takes about 30" to 45" to do all of the tires. 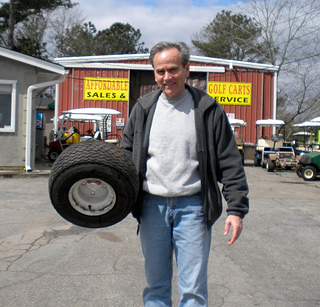 Here in a golf cart community, you can simply bring your old tire to one of our many golf cart shops to get new ones. They can match the new tire to the tires that you already have. Unlike golf cart batteries, you do not need to replace all of the tires at the same time, unless all four tires are worn. Sometimes, your tires may develop a leak, just like your car tires. Bring it up to your local car repair shop - have them check the leak and plug it up for you. It costs a lot less to do this than it does to replace the tire. 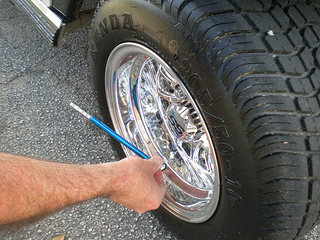 Some people have luck with a tire sealant like Fix a Flat Aerosol Tire inflator. You can also order tires on line, but be sure to check the sidewall of the tire to get your correct size. 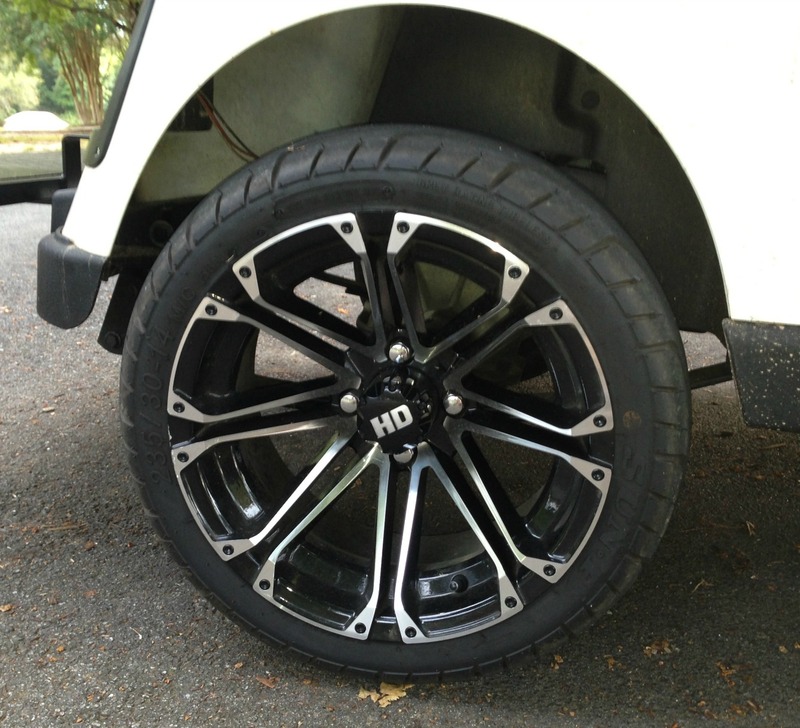 Golf cart wheels and tires can customize a look but also contribute to a more comfortable ride. Go from Golf Car Tire to Golf Carts Etc.